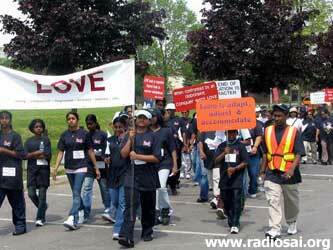 We had covered in Heart2Heart the inspiring stories of the last two ‘Walk For Values’ events held in Canada in 2004 and 2005. Here is news from the latest walk, which enthused so many devotees to contemplate on Swami’s Teachings and also brought this important eternal message to the community at large. It is no more an event, it has become a movement gaining increased momentum every passing year and inspiring other cities and regions to follow suit in spreading His message. 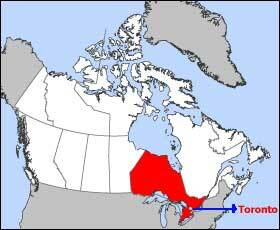 Values awareness is spreading like wild fire across Canada, and beyond. 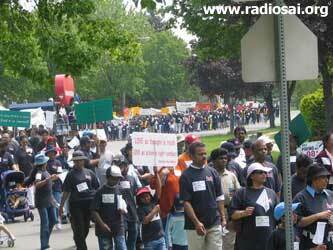 For the fourth consecutive year, the Sathya Sai School of Canada’s annual Walk for Values was held, this year on Sunday, May 28th, 2006. Apart from the grand event held in Toronto, 13 other Canadian cities walked the values talk, to express their support for the universal human values propounded and exemplified by Sri Sathya Sai Baba, founder of the Toronto based Sathya Sai School. 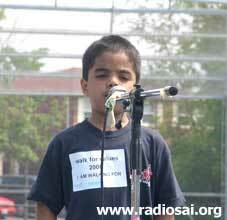 Apart from the 14 Canadian cities where supporters of the Sathya Sai School sought pledges of self-transformation, Sai Schools in other countries such as Scotland replicated this unique event in their communities. Proving that practice makes perfect, the organizers and participants of the fourth annual Walk for Values conducted this year’s event flawlessly. 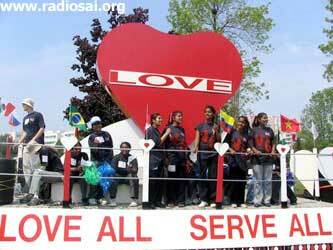 Once again, under clear, sunny skies, the students of the Sathya Sai School led a few thousand of their close supporters down the streets of the Malvern area in Scarborough, in the east end of the city of Toronto, seeking pledges of self-improvement, inspired by the greatest example and exponent of universal human values, Sri Sathya Sai Baba. It was a day of triumph for the hundreds of man-hours of volunteer work put in by scores of teams, when the event was executed smoothly, with finesse. 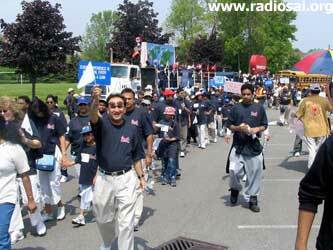 Sponsored each year by the students and parents of the Sathya Sai School of Canada, the theme for this year’s Walk for Values was “A Walk for Me, My Family and My Community”. The planning team, consisting of Sai youth from the Greater Toronto Area, hoped to make a difference in various communities by encouraging everyone to evaluate the values that guide and inspire us, while further polishing those values to become better citizens of the society and country. 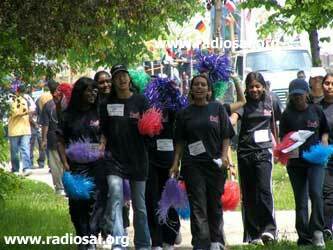 Over the years, Sai volunteers, have fine tuned the event into a turn-key operation. This year, a representative from Foothill Ranch, California came to study the walk in person, so that her community could attempt one as well. The planning team at the Sathya Sai School has gladly shared its planning and coordination templates with school supporters everywhere. Leaving nothing to chance, the volunteers had thought of every possible detail which made this year’s walk an even grander success than ever before. For instance, the marshals leading the event wore specially designed belts fitted with perfect holsters for holding the value flags which they distributed to spectators at various intersections. 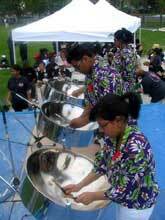 With each passing year, the event has grown in its appeal. 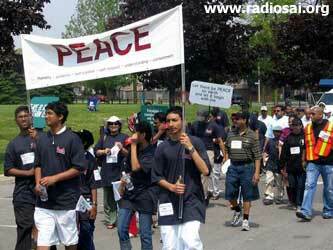 Attended by well over 3,000 participants including Honourable Harinder Takhar, Minister of Small Business and Entrepreneurship, MPP Bas Balkissoon, and City Councillor Raymond Cho, this unique Walk which was first held in the year 2003 in Malvern in the name of peace and non-violence, truth and love has become a trailblazer for cities across Canada. This year, the city of Edmonton in the province of Alberta and the cities of Regina and Saskatoon in the prairie province of Saskatchewan proclaimed May 28th as Human Values Day. For a school committed to integrating Sri Sathya Sai Baba’s Education in Human Values program within the Ontario Education Curriculum, it is indeed gratifying to see this realization among policy makers about the relevance of universal human values in all spheres of life including politics and governance. 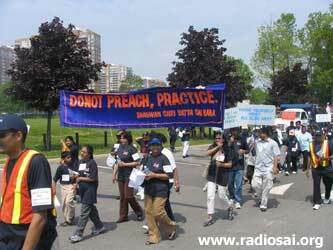 A brainchild of the Sathya Sai School of Toronto, the Walk for Values is not a money-raiser; nor is it a Walk provoked by protest or anger at any social or political injustice. Instead, participants pledge to improve the world by improving themselves by practicing a value of their choice. 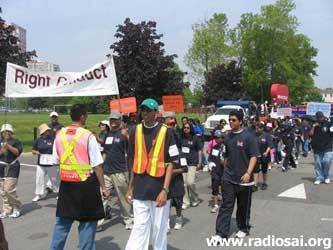 The theme for this year’s Walk: “It’s a Walk for Me, My Family, and my Community” is most appropriate in the wake of violence and bullying in our schools, drugs on our streets, gang wars in our neighbourhoods, and greed and corruption in our institutions. The following week, Mr. Bas Balkisoon, Member of the Provincial Parliament made a statement at the opening of the Ontario Legislature, complimenting the school for this event. 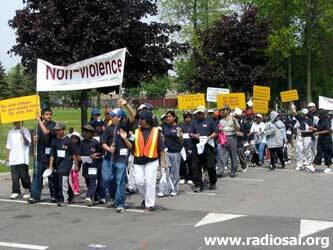 Mr. Speaker, on Sunday, May 28, the fourth annual walk for human values organized by the Sathya Sai School of Toronto took place in the Malvern Community of my riding in Scarborough Rouge River. 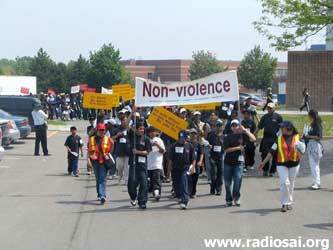 Minister Harinder Takar and myself joined over 3,000 participants from across the GTA to walk in the name of peace, nonviolence, truth, and love. One participant in the crowd, Miss Megan Bennett, traveled all the way from Foothill Ranch, California, with the goal of implementing a similar walk in her community in 2007. Mr. Speaker, this walk has now become a trailblazer for cities across Canada, 12 of which held their own Walk for Values on the same date. The Cities of Edmonton, Regina, and Saskatoon proclaimed May 28 as Human Values Day in their cities. Mr. Speaker, this walk was not about raising funds, or provoked by anger. Instead it was focused on character building and encouraging role models in the community. Walking together as kindred spirits, participants raised awareness of the need to practice the values of tolerance, understanding, and respect values that are gradually being eroded by negative forces. 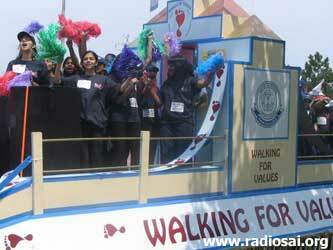 The walkers conveyed their messages of human values through songs and decorated floats. The participants' demonstrations of understanding, peace, and commitment to positive change show us all the importance of recognizing our values. Mr. Speaker, I would like to congratulate the Sathya Sai School of Toronto in their efforts in making a difference in our community, our province, and Canada through their walk for human values. To listen to the audio of Mr. Bas Balkisoon, please click here. 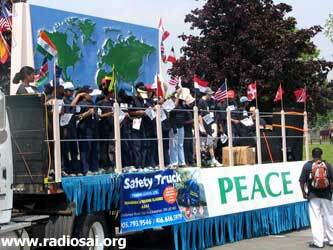 Once again, Sai youth from around the Greater Toronto Area infused the event with energy and excitement by acting as Masters of Ceremonies, cheerleaders, marshals, as members of the webcam team, registration committee, media, community outreach and public awareness teams and in countless similar capacities. 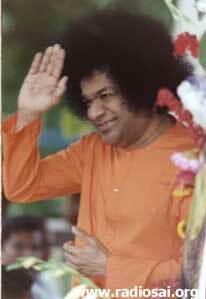 The dedication and sense of responsibility demonstrated by the youth of the Sai organization bears testimony to the success of the SSE program that has prepared them to take the message of the five human values mainstream. Over the past four years, the youth have truly added dynamism and a sense of exhilaration to the Walk for Values with their cheerfulness, love and dedication to Sai ideals. 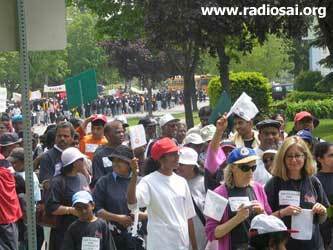 The fourth annual Walk for Values has not gone unnoticed in the community of Malvern. From the police officers assigned to the route, to the many spectators at various intersections along the 4 kilometer walk, everyone lauded the efforts of the school in bringing joy and awareness about the values to their doorsteps. The complete absence of any monetary pledges appealed to both participants and casual observers. In his communication, Mr. S.T. Pathy, a school supporter and regular participant of the event congratulated Principal Mr. Pillay for his contribution to the community of Toronto for spearheading such a noble community campaign. 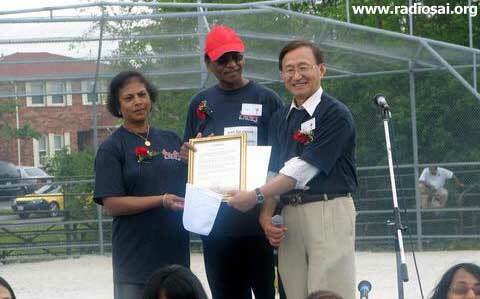 At the concluding ceremonies of the Walk for Values, on behalf of the City of Toronto, City Councillor Mr. Raymond Cho honoured Mr. Pillay, with a special plaque in appreciation of his outstanding career as an educator with a vision and devotion to integrating academic excellence with character education. While thousands of participants cheered, Mr. Pillay attributed the success of the Walk and all of the school’s accomplishments to its Founder Sri Sathya Sai Baba whom he described as the living example and the most articulate proponent of the universal human values on the face of the earth. Heart2Heart is very pleased to place before you this story and hopes to bring you news of next year’s ‘Walk for Values’ too with the hope that the individual, community, national and international participation of this very special ‘moving message’ will have grown exponentially. Dear Reader, did you like this news article? We would love to know your reactions to this article. 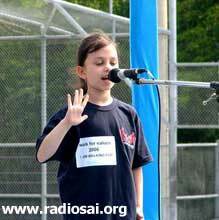 Please write to us at [email protected] mentioning your name and country.